All-new super-resolution microscope featuring acquisition speeds ten times faster than conventional N-STORM systems. 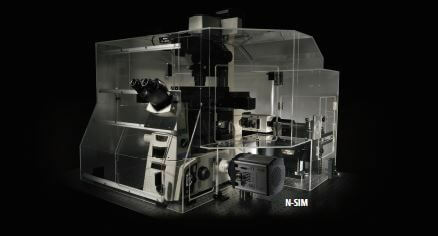 Nikon’s Next Generation N-STORM Super-Resolution Microscope System. With ten times faster acquisition speeds compared to conventional N-STORM, N-STORM 4.0 enables imaging of live cells with nanoscale resolution. 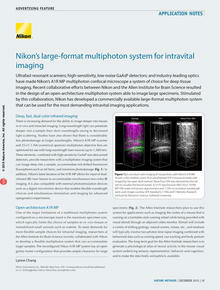 Nikon has established a leading position in the field of super resolution microscopy since the release of N-STORM in 2010. STORM, or Stochastic Optical Reconstruction Microscopy is a super-resolution technique developed by Dr. Xiaowei Zhuang, a Howard Hughes Investigator at Harvard University. The technology localizes temporally isolated fluorescent molecules to reconstruct images with nanoscale resolution (~10 times greater resolution compared to conventional light microscopy). N-STORM 4.0 is the next step in the evolution of STORM imaging, enabling STORM imaging of dynamic processes in live cells. N-STORM 4.0 utilizes an improved laser excitation design and a sCMOS camera that dramatically improves acquisition rates. 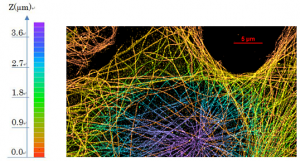 There is a rapidly growing interest in super-resolution microscopy as evidenced by the recent 2014 Nobel Prize in Chemistry awarded to the field of super-resolution microscopy. There is also an increasing need to expand these techniques to broader applications like live-cell imaging. Recent studies show that localization-based super-resolution imaging of live cells can provide unprecedented insights into the nanoscale dynamics of intracellular structures such as focal adhesions1, transferrin clusters in clathrin-coated pits2, and organelles including mitochondria and endoplasmic reticulum3. 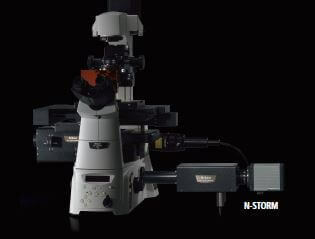 N-STORM 4.0 utilizes an improved laser excitation design and a sCMOS camera to improve acquisition rates from minutes to seconds while gathering incredibly high molecule counts. 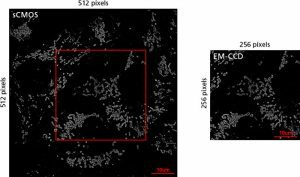 In addition, the new system offers expanded flexibility in the imaging field of view, allowing users to choose the best suited mode for their application, whether it be high-speed imaging of live cells or gathering large fields of view of fixed cells. 1 Shroff, H. et al., 2008, Nature Methods, 5 (5), p417-423. 2 Jones, S.A. et al., 2011, Nature Methods, 8 (6), p499-505. 3 Shim, S-H. et al., 2012, Proc. Natl. Acad. Sci., 109, p13978-13983. 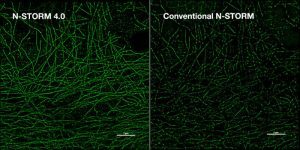 In addition to lateral super-resolution, N-STORM utilizes proprietary methods to achieve a tenfold enhancement in axial resolution over conventional optical microscopes, and effectively provide 3D information at the nanoscale. 3D-Stack function allows multiple 3D STORM images in different Z positions to be captured and merged to provide super-resolution, volume images of thick samples. 4μm z-stack STORM image of tubulin in a BSC-1 cell (Alexa Fluor® 647). Image acquisition speed has been significantly improved, increasing from minutes to seconds* for a single shot, due to newly developed optics and illumination systems optimized for the sCMOS camera, which is capable of approximately 10 times faster image acquisition than before. Thanks to this improvement, it is now possible to acquire dynamics of living specimens at a resolution 10 times greater than that of conventional optical microscopes. Time lapse STORM image of African green monkey kidney cell (BSC-1) labeled with Mito-Tracker Red (Mitochondria). The image on the right is an enlargement of the area indicated by the arrow in the image on the left. Cell division and fusion of mitochondria can be observed at the molecular level. The newly developed illumination magnifying lens, improved laser excitation efficiency, and increased image acquisition rate successfully enhance the density of molecules per unit area and provide much clearer images with high molecule counts. 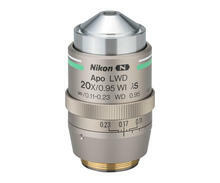 Intermediate zoom lenses in the imaging system have been newly developed and optimized for a wide field of view. The wide-view mode is achieved at 80 μm x 80 μm, which is an imaging area 4 times wider than before. HP (High Power) objectives are compatible with high power lasers that are required for the fast blinks of fluorophores. Thanks to the improved correction of axial chromatic aberration, 3D multi-color fluorescence imaging is also available with higher precision than ever. Super-resolution techniques have had a significant impact on our understanding of biological processes at the molecular level. However, one of the challenges to their broad utilization has been our limited ability to quantitatively analyze super-resolution images of complex biological tissues. In this Application Note, we highlight recent work by Dudok et al. utilizing Nikon’s N-STORM system to develop new correlative imaging methods and quantitative analysis tools to study the mechanism of cannabinoid signaling in the brain.